My 10 year-old cat began having difficulty jumping up in the window to watch the birds, and he sometimes seems stiff when he gets up in the morning. His veterinarian has diagnosed osteoarthritis. What does this mean? 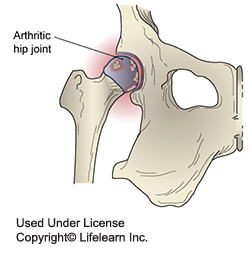 Osteoarthritis (OA) is a complex condition involving inflammation and degeneration of one or more joints. The word osteoarthritis is derived from several words in Greek: osteo meaning “bone,” arthro meaning “joint,” and itis meaning “inflammation.” Cats with OA experience pain and inflammation in various joints that interfere with the activities of daily living. OA is diagnosed through a combination of a thorough physical examination, a palpation (feeling with the fingers to localize pain and determine its intensity), and additional diagnostics including x-rays or other imaging technology. About 90% of cats over the age of 10 years experience OA in at least one joint. In fact, most cats with OA experience a combination of these factors as their OA develops and progresses. We now know that just “getting old” is NOT a cause of OA. Are there other signs of OA besides difficulty jumping up into a window? The veterinarian said that my cat is overweight and prescribed new food as well as some medications and nutraceuticals. Why are there so many things for me to give my cat? Unfortunately, there is no “magic bullet” for treating OA. In fact, once OA is in place, we are not so much treating it as managing it because OA cannot be cured. Non-steroidal Anti-Inflammatory Drugs (NSAIDs) are generally used as the first line of defense against the pain of OA. Your veterinarian will determine if your cat is a good candidate for this class of medication. Gabapentin is a pain medication that addresses chronic pain differently from NSAIDs or corticosteroids, and complements those medications. It provides a way to address the chronic nature of OA pain, and is especially helpful when the patient is older and not able to take a NSAID. It is important never to reach into your own medicine cabinet when your cat limps or has been diagnosed with OA. When a nutritional supplement has medicinal effects, it is called a “nutraceutical.” There are many of these products on the market, many labeled for use with joint disease. Be sure to ask your veterinarian about the scientific data that supports nutraceuticals that she prescribes. Medical acupuncture can provide excellent pain relief for many cats with OA. Likewise, other physical medicine disciplines like chiropractic and medical massage may be useful. Finally, physical rehabilitation is a discipline that translates physical therapy techniques from human medicine for application to animal patients. These techniques include (but are not limited to) therapeutic LASER, therapeutic exercise, joint mobilization, and hydrotherapy using an underwater treadmill. To find a board-certified specialist in your area, visit the website for the American College of Veterinary Sports Medicine and Rehabilitation at Helping Your Cat With Osteoarthritis for more ideas. What is my cat’s long-term outlook? With appropriate management, cats with OA can and do live a normal life expectancy. Your veterinarian can provide specific guidance about lifestyle adjustments. Can feline OA be prevented? Allowing a cat to grow slowly as a kitten, maintaining a lean body condition throughout growth and into adulthood, is the mostimportant way to prevent OA. Growth abnormalities and injuries cannot always be predicted, so even our best efforts may not be enough to ward off OA in an older cat. That said, with slow growth, good nutrition, optimal body condition, and regular exercise, the odds of preventing or at least delaying OA are excellent. Your veterinarian will partner with you to create the best plan for your cat. ← Need Help Paying For Your Pet’s Medical Bills?